No better way to explore a city than by meeting its inhabitants. 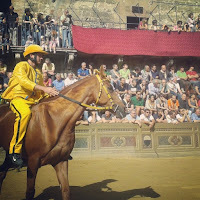 This interview with Lisa Jane Cappannini is the first one of a series of articles with Siena tips and insight by people who live here or who have a special connection to the city of the Palio. Are you from Siena? Or when did you fall in love with Siena? I was born in England but at the age of 2 my parents moved to Siena, which is where my father is from. I grew up and went to school in Siena and I lived there till I was 24. My parents still live in the same house inside the historical centre, while I live in Montalcino, 50 minutes south of Siena. the Duomo, the cathedral, which is not just beautiful from the outside, it’s also so rich inside. The marble floors are unique in the entire world, and if you happen to visit the Duomo between mid August and mid October, you’ll be lucky enough to see the floors completely uncovered. From this year, you can also visit the upper part of the cathedral, which has just been restored and opened to the public. Be prepared for some unforgettable, spectacular views. 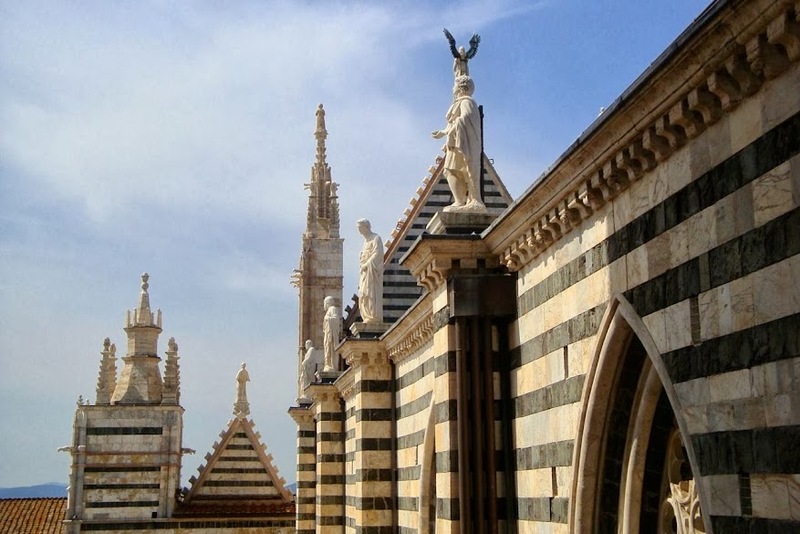 Speaking of views, if you are not afraid of heights, don't miss to climb to the top of what should have been the façade of the 'new' Duomo (il Facciatone entrance via the Opa museum) or the top of la Torre del Mangia, the town hall tower. If you decide to go up il Facciatone, you should still visit Palazzo Pubblico, the town hall in magnificent piazza del Campo, one of the most beautiful squares in the world. This is where, twice a year, the famous horse race called il Palio is held. The square lies in the middle of the three hills on which Siena was built. 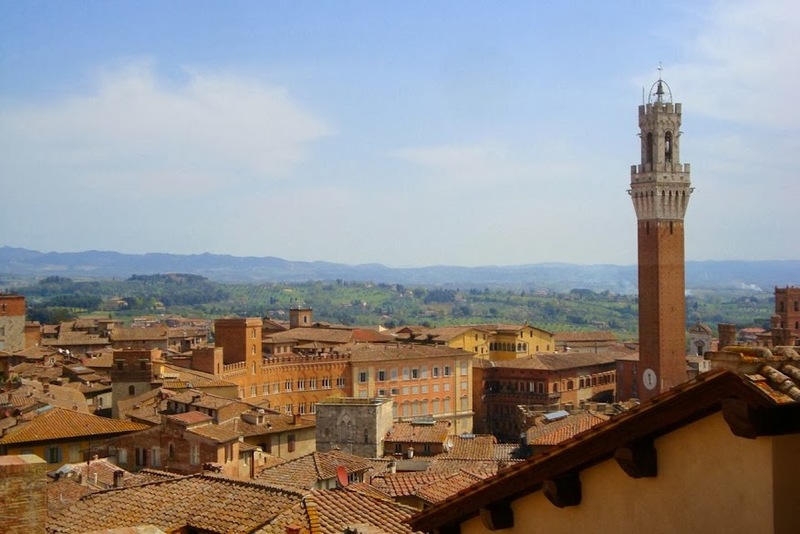 Your favorite panorama view of Siena or photo opportunitty in town? My favorite photo opportunity is just below the church of San Domenico, from there you get a wonderful perspective of the town. My advice is to go there around lunch time, as there are some nice restaurants and pizzerias where you can grab something to eat while enjoying this beautiful view. Any shopping secrets in Siena? Every Wednesday there’s a huge market held below the fortress where you can find everything, including some real bargains: clothes, shoes, linen, crafts, food, plants, etc. Your favorite museum or work of art in Siena? 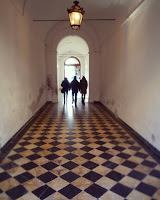 The museum of Santa Maria della Scala is pretty amazing, but I would only recommend to visit it with a professional guide, otherwise you would loose the meaning of this historical place. Same thing about the Biccherne museum, which is a very unique, fascinating and quite unknown museum, which contains the history of Siena since the Middle Ages. In case you are willing to know more about Siena and spend three or more memorable hours with a professional guide, there are two persons I highly recommend: Antonella Piredda and Ilaria Bichi Ruspoli. Are you a Palio lover? If so, any tips on how to best join the crowd? I wouldn’t say that I’m a Palio lover, because the Palio brings out a lot of more and complicated feelings than just simple love… let’s say that the Palio is in my blood. 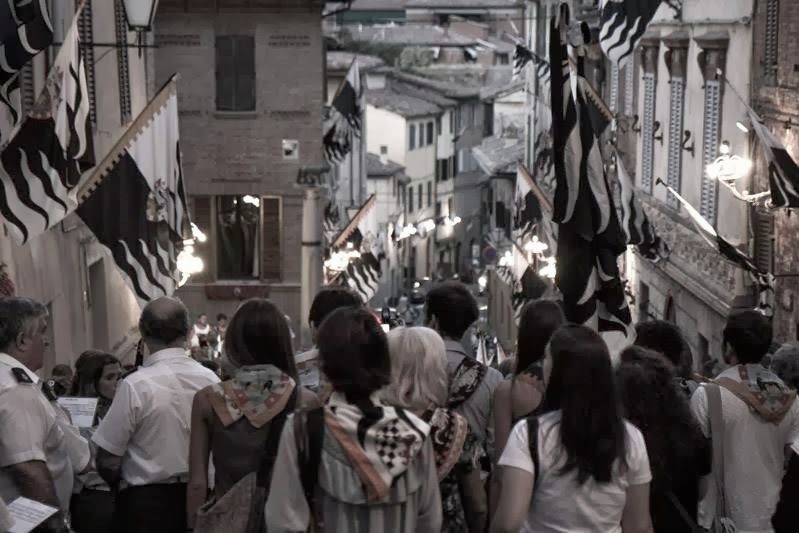 The Palio goes down deep in the roots of this town. It brings out the character of the Sienese, which are very territorial, passionate, proud and… a bit crazy! To join the crowd, come for the entire four days. On the first day every contrada is given a horse, and it’s a very exciting moment. Go to see the drawing in the Campo square and choose a contrada (neighborhood) to follow back to their territory (it would be best a contrada which is not too big). Go back there in the late afternoon. There’s always a bar where they all meet, ask for something to drink and see if you can find someone who speaks English. Ask them if you can come back for dinner after the trial. There’s a trial every morning and every evening till the actual race, and after every evening trial there’s a meal in every contrada. Join them and get into the atmosphere. 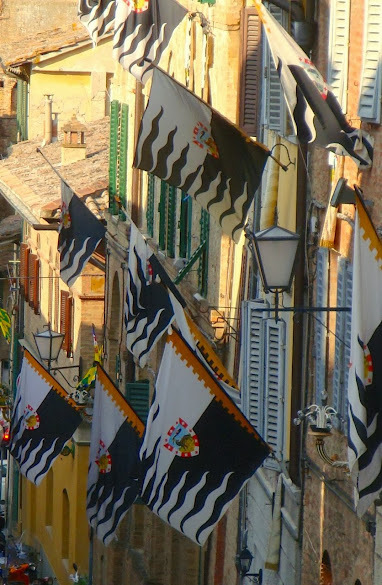 Are you a supporter of a particular contrada (neighborhood) in Siena? Oh yes, I’m from la Lupa, the she-wolf. La Lupa is where my father was born and where he grew up. As I said I was born in England, but when that happened, a flag of la Lupa was placed outside the church of la Lupa with a pink bow. This always happens in Siena when a new child is born. When my mum and dad brought me to Siena for the first time, I was immediately baptized. A contrada is like a large family and we belong to it. Something we may not know about Siena? Did you know that underneath Siena there are many water collecting tunnels called bottini, which were built during the Middle Ages? The Medici didn’t know and when they besieged Siena they expected the Sienese to surrender in a very short time, as they supposed there was no water as the town lies uphill. There are many beautiful fountains in Siena, the major one is of course the one in the Campo square, Fonte Gaia, which means joy, from the joy of the people when the water first arrived in town. What about the people from Palio town? Three words to describe the idiosyncrasies of the Tuscan inhabitants of Siena. Any tips on how to see Siena without the tourists? Not easy unless you come in winter! If you are visiting during the high season, from April to end of October, then the best time to enjoy Siena is in the evening, when there are less tourists around. It is also my favorite time to come back to Siena, not mentioning the fact that in summer, during the day, it can be very hot. In the evening you can get more of the authentic medieval atmosphere, just by strolling through the small alleyways. Never forget to look up, as you may see some wonderful frescoes through open windows. A day out of town: where would you take people in the surrounding countryside? To Montalcino of course, where I live now, to escape from the crowds and enjoy a nice glass of Brunello wine in total relax! A must-have souvenir from Siena or Tuscany? A bottle of wine! Once home, it will bring back all the wonderful memories of this beautiful region. 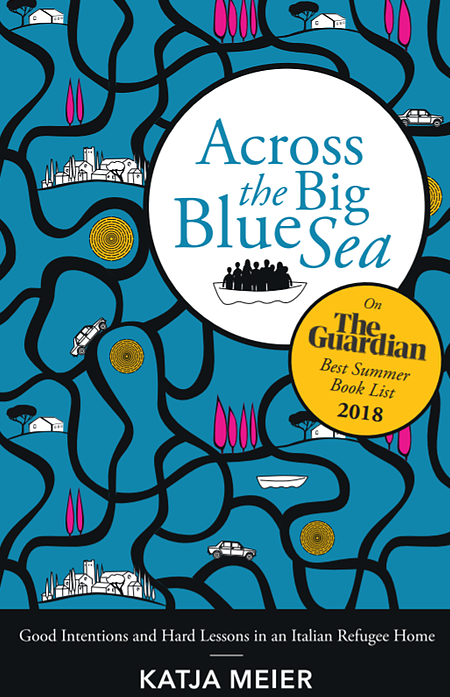 Any advice for a great hotel or B&B in or around Siena? My best recommendation in Siena is certainly Palazzo Ravizza, a historic and beautifully restored pension with a wonderful atmosphere. There’s a nice Italian style garden where you can enjoy breakfast or escape from the crowds, and a private car park, two real bonuses inside the city walls. Your favorite season, month or time of the day in Siena? As I said my favorite time of the day in Siena is the evening. Regarding the seasons, definitely either spring or autumn. 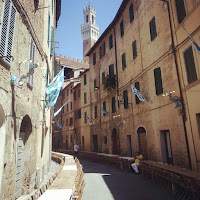 A don’t miss event or festival in Siena? Kids in Siena: Where to let them loose? Inside the fortress, they can play safely and you can enjoy another nice view of Siena and the surroundings. If not here, where? What other place in the world could be your home if you weren't living in Tuscany? If I could in winter I’d move to Sicily, another wonderful region, full of traditions, extremely passionate and with gorgeous food! Lisa Jane Cappannini, was born in Nottingham in 1974 but raised in Siena. Her parents met while working in a hotel in Cornwall in 1969. In 1994, after finishing school, she went to work in the same hotel, and since then has worked in some fine hotels including the Palazzo Ravizza in Siena, Dievole in the Chianti region and La Locanda dell’Amorosa in Sinalunga. Her father was a chef and a sommelier and when she was a child her parents had a restaurant in Siena. She was brought up with good food and good wine sitting on the table. Lisa Jane moved to Montalcino in 2006 to learn more about the wine world, and worked for some fine estates like Poggio Antico, Mastrojanni and Biondi Santi. She always wanted to live in the countryside, and despite her love for Siena, the town always felt too tight for her. Her passion for wine grew stronger, she made many friends and Montalcino became the place to be. Four years ago she was given the opportunity to manage SUITE D'ARTISTA, a property with 5 recently restored apartments all overlooking a beautiful panoramic garden inside Montalcino's historic town center. This was her dream come true. All photos in this article courtesy of Lisa Jane Cappannini.